Beijing (VNA) – China put forward a seven-point proposal on China-ASEAN cooperation during a meeting between foreign ministers from ASEAN and China in Manila, the Philippines on August 6. At the meeting, the two sides expressed satisfaction with achievements in their strategic partnership during the last 15 years and agreed to deepen ties. 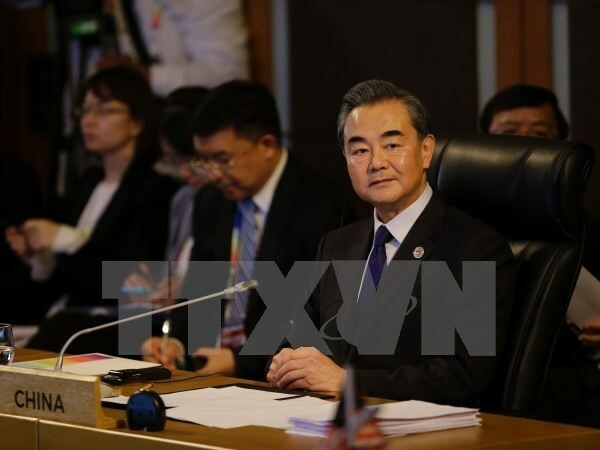 In his remarks at the event, Chinese Foreign Minister Wang Yi congratulated ASEAN on its 50th anniversary and expressed his delight at the bloc’s development, extending his best wishes for it in the next five decades. As an important regional organisation, ASEAN has become a major force in enhancing regional integration and maintaining regional peace and stability, Wang said. ASEAN has always been a priority in China’s foreign diplomacy, he noted, adding that China has consistently supported ASEAN in taking a central role in regional cooperation and a bigger role in dealing with international issues. As ASEAN and China will celebrate the 15th year of their strategic partnership next year, Wang urged for actions to upgrade the partnership to a higher level and build closer relations between the two sides. He outlined a seven-point proposal on bilateral cooperation in the future which firstly suggested formulating a 2030 Vision for ASEAN-China Strategic Partnership as a blueprint. The second point is to synergise the Belt and Road Initiative and the Master Plan on ASEAN Connectivity and further expand the cooperation’s scope. Third, he suggested 2018 become ASEAN-China Year of Innovation, aiming to make use of the innovation-driven development of ASEAN and China, and to upgrade bilateral cooperation. He also proposed the two sides to fast-track implementation of the upgrade of the ASEAN-China Free Trade Area and together protect global free trade. Fifth, he called for the two sides to fully implement the ASEAN-China Joint Statement on Production Capacity Cooperation and foster each other’s industrialisation. Additionally, Yi urged building new pillars for people-to-people exchanges and cooperation, ensuring the success of the ASEAN-China Tourism Cooperation Year and issuing a joint statement on tourism cooperation. Finally, he suggested accelerating negotiations on the Regional Comprehensive Economic Partnership. For their parts, ASEAN foreign ministers voiced expectations that the two sides will increase strategic collaboration in economy, trade, innovation, connectivity, tourism and more to improve their strategic partnership.